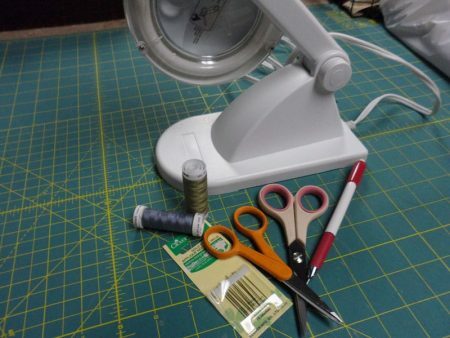 Cutting Mat, Rotary Cutter and Sewing Machine Tips & Maintenance to Keep You Sewing! We all want to just sit down and sew and not think about anything else. In a busy life, those precious few hours a week or month are a break from the everyday rush. So, when something goes wrong with the equipment and tools you use for this escape, that’s not good! In this blog post, I will share everyday maintenance that you can do to keep things in tip top shape so you can sit and sew with no worries! After buying the pattern and fabric, the next thing you do is cut the quilt pieces from that fabric. The tools you use, your cutting mat, rulers and rotary cutter, can make your experience great or give you headaches. First, keep your cutting mat in good shape by storing it properly. If you do not have a dedicated cutting area where the board can be kept flat, make sure it’s stored flat, like under a bed or on a large shelf. 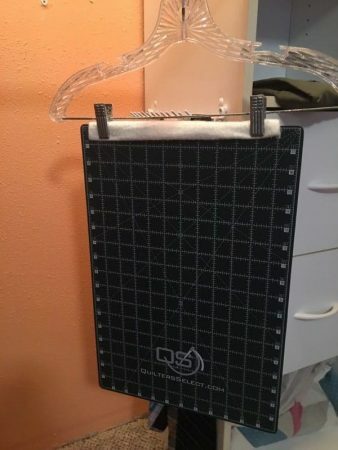 Another way I’ve stored extra mats is hanging them in a closet from clip hangers. I put a bit of batting on the part of the board that the clips will attach to to keep it from creating a permanent dent. This is a great space saving storage solution especially if you do not have big flat area to store the mat when not in use. Another maintenance duty we often neglect is cleaning your cutting mat. 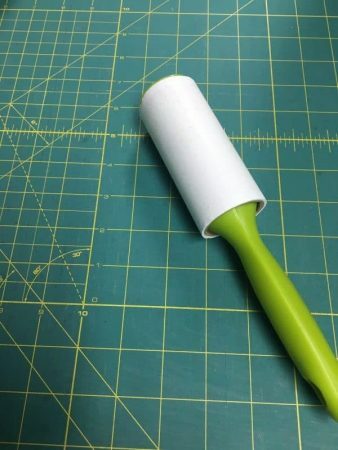 To remove stray threads from previous cutting activity, you can use a pet hair roller. Run it across the board to remove threads that may be caught in some of the cuts in your mat. You’d be surprised how little bits of debris that you think won’t hamper your cutting will actually do just that. Another good maintenance duty is to periodically wash your mat. Use room temperature water since hot water, like heat from direct sunlight, can damage your mat. You can add a few drops of mild dish soap to the water. Use a soft brush, like a gentle vegetable brush or tooth brush, to gently scrub the mat. This will dislodge tiny fibers that get caught in the cuts of the mat. Finally, rinse the mat with cool water and towel dry (try to choose a towel that is not prone to leaving lint). Lay flat or hang (like above) to dry. Doing this bit of maintenance will extend the life of your cutting mat. Another tip to keep your mat “healthy”…. when cutting fabrics that leave a lot of lint and fibers like batting or fleece, do not cut in the same place on the mat for all the pieces you cut. Move around to give the cuts in your mat time to self heal. The day I discovered the rotary cutter when I was a quilting beginner was a happy, happy day! My first quilting class did not teach cutting the fabric with a rotary cutter. We used templates, traced and cut each piece individually. 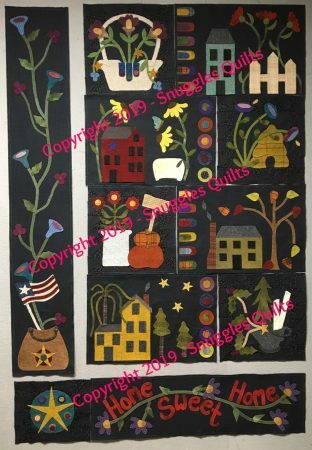 It’s a wonder I wanted to keep quilting after learning to cut in this labor intensive way! Safety first! The rotary cutter has a very sharp blade, as we know (I know from personal experience and a trip to the ER!). The first safety tip is to make sure you have a fresh blade. The blade might look good to the naked eye, but if you feel like you have to press down hard to cut through all the layers of fabric, it’s time to change the blade. Also, if you notice “skips” in the cutting, that’s another sign that your blade is dulling. 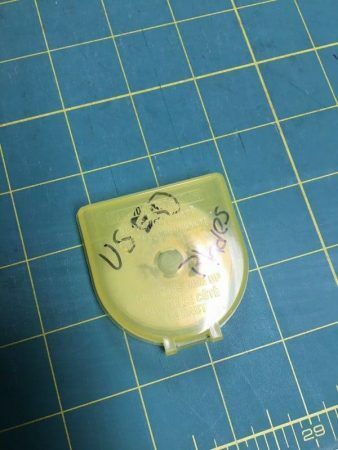 Once you change the blade, store the used one in an empty rotary blade container marked “used blades”. Once it’s full, you can safely toss it away. To make my cutting experience even safer, I never leave the blade open. 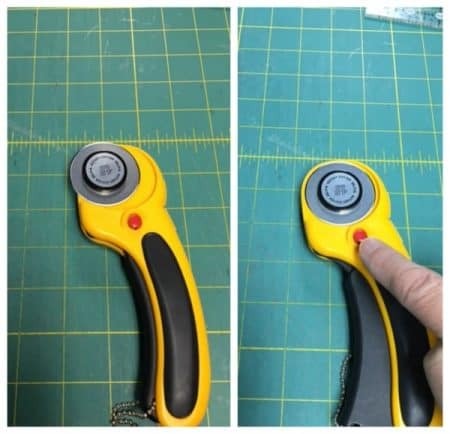 Use the lock button as well so no one can accidentally open the cutter. 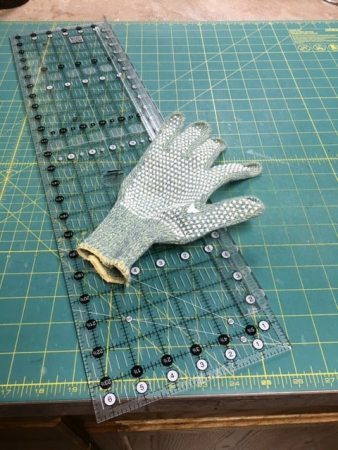 The ruler safety shield keeps the rotary cutter from skipping across the ruler and hitting my hand and the klutz glove is extra protection. Finally, make sure your sewing machine is ready for use the next time you want to sew. I do this by cleaning and oiling my machine after every project. Your machine should have a small brush that came with it along with oil. Consult your owner’s manual on how to clean the lint from the bobbin compartment, under the throat plate and any other area where lint collects. Also, change your needle! I change my needle after every project. You may not see damage to the needle, but under a microscope, you would see the wear and tear from use. It’s best to start with a fresh needle so it won’t snag your fabric or break your thread. 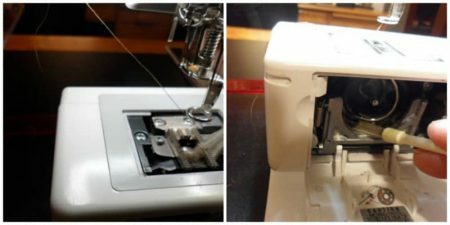 So, now you’re ready to sew the next time you get a free hour or two and you won’t have to worry about wasting time on the above tasks. 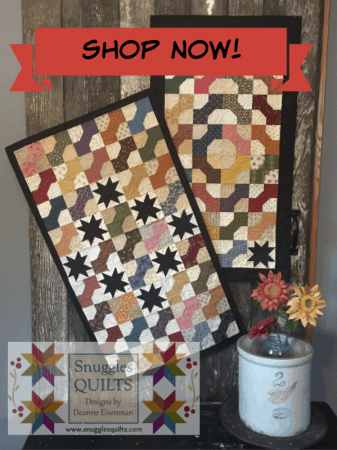 You can jump right in to cutting and sewing that next quilt! Do you have tips to share? Let me know some of your routine cleaning, prepping or safety tips. We can never stop learning!